The Nigerian Stock Exchange (NSE), and the London Stock Exchange Group (LSEG) will Friday, June 1, 2018, host the 5th edition of the NSE-LSE Dual Listing Conference to deliberate on strategies that will attract global capital for Nigeria’s economic reforms. 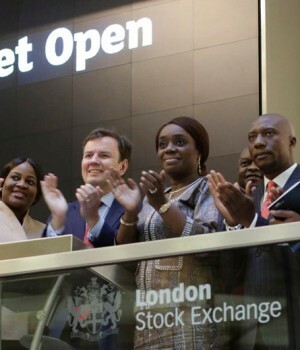 Uncovering results from past held conferences, Oscar Onyema, CEO of the NSE stated that the recent dual listing of the first-ever FGN Sovereign FX denominated $1 billion Eurobond on the NSE and LSE gives credence to the successful partnership between the two exchange. Speaking about the conference, Onyema said that, “this event comes at a time when Nigeria has turned a corner from its worst recession in over two decades to have the best performing stock Exchange in Africa and third best performing globally. “I have no doubt that the insightful deliberations at this conference will drive the level of engagement and idea generation that will solidify and strengthen our capital markets partnership and reinforce the drive of Federal, States, and Corporates in accessing the deep pool of capital inherent in the Nigerian capital market and on the London Bourse. “I encourage us to utilise the opportunities that exist between our exchanges to enhance capacity in our markets and promote diversity of investment products to meet the needs of a wide range of investors and issuers”. This year’s conference themed, “Attracting Global Capital to Drive Nigeria’s Economic Reforms and Sustainable Growth Development,” is billed to take place at Wheathbaker Hotel, Ikoyi, Lagos, Nigeria. The NSE says it will bring together companies keen to explore a London/Lagos dual listing, corporate finance experts, lawyers, capital market operators, regulators, government officials, media and thought leaders to discuss investment opportunities in Nigeria. Nikhil Rathi, chief executive officer, London Stock Exchange Plc said, “The fifth NSE-London Stock Exchange Dual Listing Conference is a reflection of the strength of the partnership between our two exchanges and the global investment community’s strong desire to be a part of the Nigeria story. Confirmed speakers for the event include: Abimbola Ogunbanjo, Council President, NSE; Oscar N. Onyema, CEO, NSE; Mary Uduk, acting director general, Securities and Exchange Commission (SEC); Laure Beaufils, British Deputy High Commissioner; Patience Oniha, director general, Debt Management Office; Hajia Aisha Dahir-Umar, acting director general, National Pension Commission; Eme Essien Lore, country manager, International Finance Corporation; Benedict Oramah, president, The African Export-Import Bank; Doyin Salami, senior fellow/associate professor, Lagos Business School, Pan Atlantic University; Tinuade Awe, executive director regulations, NSE; Alex Okoh, director general, Bureau of Public Enterprises; Haruna Jalo-Waziri, CEO, Central Securities Clearing System Plc; Tonye Cole, co-founder, Sahara Group Ltd and Yvonne Ike, head of sub Saharan Africa, Bank of America Merrill Lynch. Others include: Ibukun Adebayo, co-head emerging markets, International Markets Unit, LSEG; Abdulkadir Abbas, deputy director, SEC; Tony Edwards, partner, Stephenson Harwood LLP; Tony Ibeziako, acting divisional head, primary markets, NSE; Funso Akere, CEO, Stanbic IBTC Capital Ltd; Abiodun Sanusi, Director, Coronation Merchant Bank; Brian Egan, Group CFO, Dangote Cement; Omair Mohyal, Fixed Income Product Specialist, LSEG; Chinua Azubike, CEO- Infracredit; Kobby Bentsi-Enchill, Executive Director, Stanbic IBTC Capital Ltd; Vivien Shobo, CEO, Agusto &Co; Dapo Olagunju, managing director, West Africa-JP Morgan; Zeal Akaraiwe, CEO, Graeme Blaque and Iyobosa Sorae, head trading, FI & Treasury, Coronation Merchant Bank.